5- From the side menu , Click on Save & Reboot , then click on save . 8- From the side menu , Click on Save & Reboot , then click on save . - Always Block : Turn on to block all incoming calls. 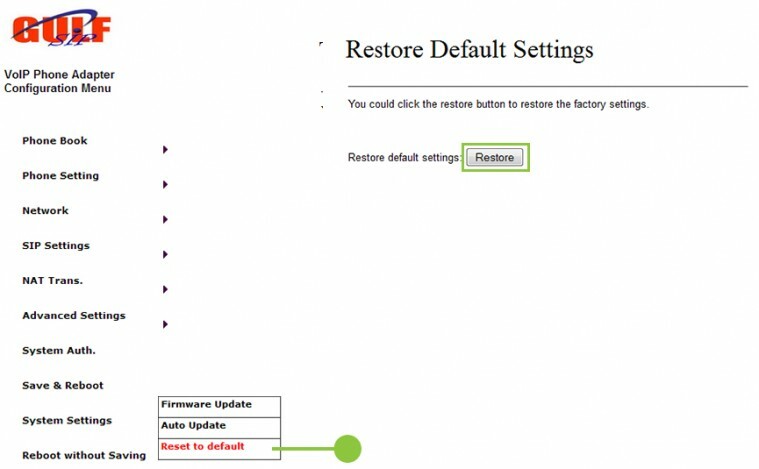 3 – From the side menu , Click on Save & Reboot , then click on save . 5 – From the side menu , Click on Save & Reboot , then click on save . • Change the port for the GULFSIP device, dial #190# you will hear a disconnecting tone, hang the phone and pick it up again and dial #1276000# from the phone connected to the GULFSIP device then hang the phone. 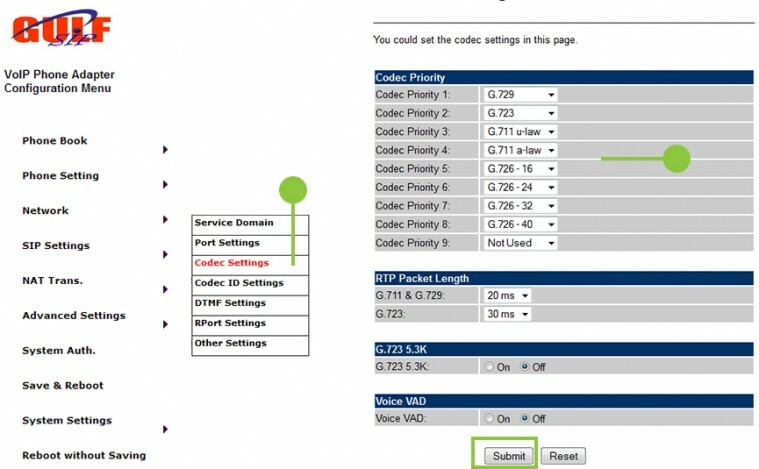 • Put the power adapter in a socket in the wall direct; also make sure that the power adapter used is correct values (output) as shown in connection page. Note: If after making a reset to the device you still don’t hear anything, then that might mean there is a problem with you power adapter. You can try to get new one same specification as shown in connection page or contact our customer service. • Change port by dialing #190# , you will hear a disconnecting tone, hang the phone and pick it up , and dial #1276000# from the phone connected to the GULFSIP device, then hang up.